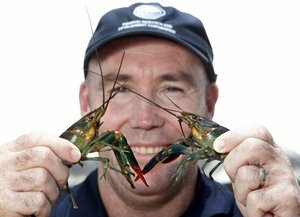 The education and training of the next generation of the Northern Territory’s seafood industry is in good hands with a Charles Darwin University aquaculture lecturer selected to take part in the National Seafood Industry Leadership Program 2013. CDU aquaculture lecturer Chadd Mumme is one of 16 participants from around Australia selected to take part in this year’s program funded through the Fisheries Research and Development Corporation. As a lecturer in Seafood Industry (Aquaculture), Mr Mumme trains VET in School students, works with Indigenous communities in the NT, and facilitates and delivers workshops in Aquaponics to the general public. “The NT has one of the best fisheries nationally, so there is a great future for those looking at getting into the industry, whether it is through Aquaculture, Fisheries Management and research, or at a commercial level,” he said. Mr Mumme said the leadership program would not only help him build leadership skills, but also provide networking opportunities with other participants to build his knowledge of other programs and seafood industry issues. “Participants are from all sectors of the Australian seafood industry ranging from grass roots through to policy-makers, academics, professional fishers, and Indigenous and recreational fishers, so we will be able to collaborate and share our knowledge,” he said. “One of my major roles at CDU is to build skills, knowledge and experience with Indigenous communities to assist them to maintain their aquaculture programs,” he said. Mr Mumme’s vision is to continue training and educating to ensure the viability and sustainability of the seafood industry for future generations. “My main aim is to educate the younger generation and build trusting relationships with Indigenous communities and keep developing skills sets for them so that people with limited education can learn about the seafood industry,” he said. Mr Mumme will travel to Fremantle, Sydney and Canberra over the next six months to attend workshops as part of the leadership program. The program is a Rural Training Initiative funded by the Fisheries Research and Development Corporation and the Sydney Fish Markets.